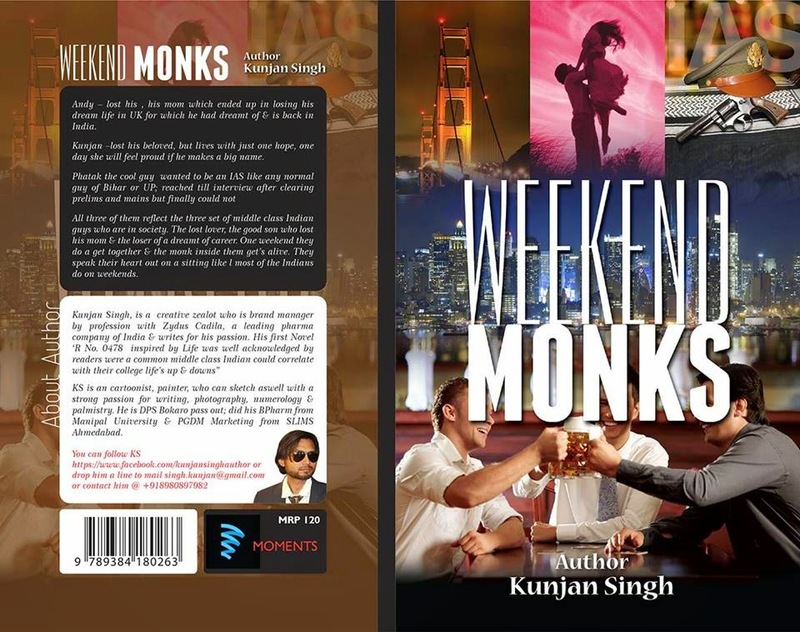 THE WRITING BUDDHA - Opinions | Books | Movies: Weekend Monks by Kunjan Singh (Book Review)!!! I haven't read Kunjan Singh's 1st book "RNo. 0478" but incidentally, I picked up "Weekend Monks" which is his 2nd and latest attempt. It's kind of a novella as its very small in size and ends in 120 pages. The cover page of the book is interesting which urges you to pick it up. The book is a very light read which you can read while traveling or over an evening in parts while having your tea. Singh have written it with a different purpose all together. It isn't a story but just a conversation between three friends who met one night for having drinks together. It starts with the same and ends with the same with conversation on no particular topic; just sharing of bad experiences of each one of them. Author have kept it quite autobiographical because of which you won't find any kind of fiction element in any of the pages. Language used is very easy and narration is kept in proper flow without confusing reader a bit. The writing style of author depicts that he basically writes for his friends and near by as he inspires from people around him and adds very little fiction to the same. The characterization is nicely done because of which you will find yourself getting connected with each character. Coming to the drawbacks: I was disappointed as the book didn't turn out to be a story. Andy's dialogue "Come out of her" said to Kunjan gets repeated so often that it pisses the reader. In the end pages, I was expecting some surprise which didn't come through and the book ends abruptly. I wish if author reads more fiction books so that he develops a story next time and comes up with a book that's targeted towards masses. Summarily, a very light read. People interested in such stuffs can pick it up.